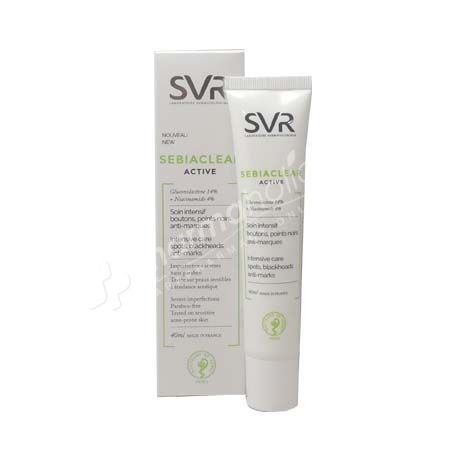 SVR Sebiaclear Active 40ml is an intensive care for spots, blackheads and severe imperfections specially formulated for the sensitive to acne-prone skins. This complete care made a reinforced action as it allows to eliminate effectively the spots and blackheads, it corrects the pores and controls shine. The residual marks present on your face are visibly reduced. This care contains dermatologic actives as niacinamide that curbs the proliferation of bacteria and eliminates blemishes caused by inflammation. It contains also Gluconolactone associated to salicylic acid and a matifying agent that will allow to refine the skin texture, unblock clogged pores, limit the formation of blemishes and regulate sebum excess. Its oil-free formula insures a lasting moisturizing and matifying action and do not leaves any oily finish on your skin. It insures an excellent make-up base. Tested on sensitive acne-prone skin. Apply in the morning and/or evening to thoroughly cleased face. Use alone or in addition to dermatological treatments. Indication : To reduce the imperfections : spots, blackheads.